The “Audio Newspaper Experience Design” project creates an accessible and emotional sound experience for the blind and visually impaired. By using a user centric approach, sound elements were developed in order to both enhance the experience of a spoken-only audio newspaper and provide a sound identity to its listeners. How can we revamp an audio newspaper? How can we revamp such a newspaper when its audience are blind and visually impaired people? And how can we revamp such a newspaper when it needs to be played back in an accessible audio format? 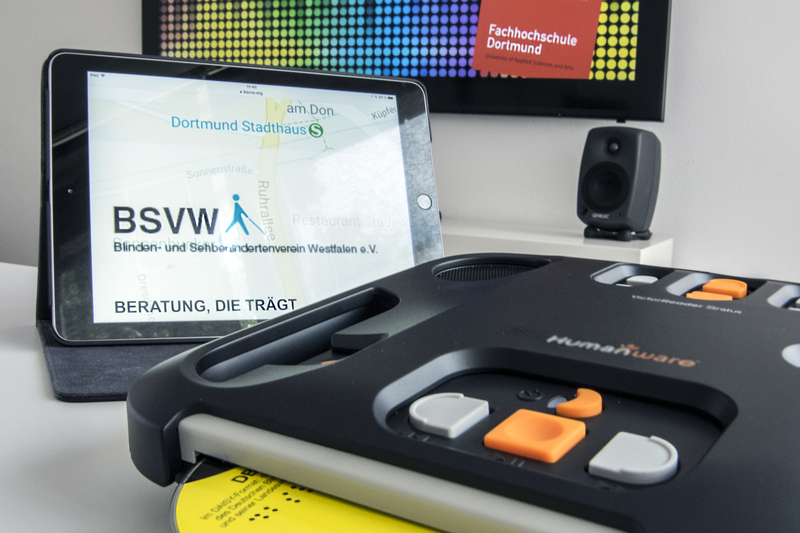 The “Audio Newspaper Experience Design” project created an accessible and emotional sound experience that enhances the audio newspaper “Hörmal” (Listen up! ), produced by the “Blinden- und Sehbehindertenverband Westfalen e.V.” (The Westphalia Association for the Blind and Visually Impaired). This audio newspaper is distributed to its listeners through a physical data transporter, a CD in the DAISY (Digital Accessible Information System) format, which can be played with a compatible DAISY device or software. By conducting close user research, working together with the blind association’s team and applying a usability and sound branding design approach to the project, the team of sound designers developed sound elements that conjointly fulfil the purpose of station ID, background music and intuitive acoustic chapter navigation. Most notably, however, this audio newspaper experience design offers a recognisable sound identity to its target group and beyond. Hence, the “Audio Newspaper Experience Design“ successfully fulfills its responsibility to provide a universal sound design solution. It ensures functionality through sound while equally representing the world of its audience. An audience that interacts with the world especially through sounds. The “Audio Newspaper Experience Design” was a project conducted within the “Master of Arts in Sound” degree program at the “Fachhochschule Dortmund – University of Applied Sciences and Art”.